I just finished my first attempt at fair isle knitting - a "star hat" - I did this in the round - and knitted it too short. I went to Bishop's yarn shop and one of the ladies there picked up the stitches around the brim for me with a crochet hook and I knitted a 2x2 rib on the bottome - it made the hat the right length - it turns out that a hat should be about 7" tall, and around 21" in circumfrence. I started my next hat - the same design but in burgundy and brown for the stars. I also changed it up a little; I did the same 2x2 rib for the base, and the same single line in the contrasting color, but I didn't do the ribbing on the main part of the cap. we'll see what it turns out to look like. This hat is destined for a secret pal - I need to get that packet shipped out tomorrow! PAL will me love it!!! Did you get that pattern off menwhoknit? 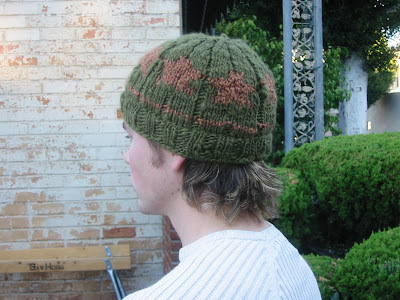 I saw one similiar but I think it was intarsia.